So, let’s pick up where we left off yesterday, shall we? Today, we’ll continue with the next five designers on my Top 20 list. These five gentlemen bring an air of sophistication to everything they do. While they share a modern, tailored approach, each designer’s work is distinctly his own. Thom Filicia: Thom brings a relaxed sensibility to his work that I adore. Take the living room pictured above for instance. It is completely chic and elegant, yet it feels totally casual and inviting. You can just as easily picture yourself having cocktails with friends in this room as you can imagine lounging on the sofa with a pile of magazines. 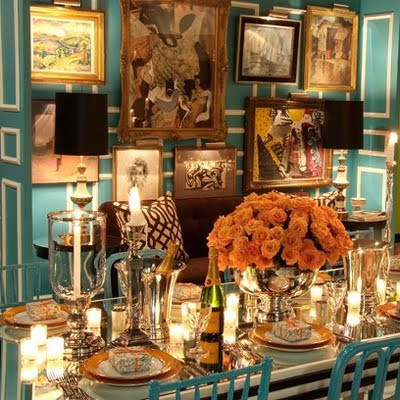 I love the way he accessorizes each room, creating a layered feel. Todd Romano: I love Todd Romano’s fearless approach to design. He often mixes textures, patterns, and bold colors with amazing results. I admire the fact that he always incorporates artwork into his rooms. This fellow Texas native is a mix-master of sorts. He blends furniture from various periods, new pieces and antiques, traditional and modern with complete bravado. Thomas O’Brien: What can I say about Thomas O’Brien that hasn’t already been said? He has accomplished what so many designers hope for. He is highly revered by design aficionados and has received critical acclaim, plus he has achieved enormous commercial success through his collections for Visual Comfort & Co., Hickory Chair, Reed & Barton, Safavieh, Groundworks-Lee Jofa, Waterworks, and Target. Spaces designed by Thomas always feel so personal, mostly through his brilliant way of layering accessories. There is also an architectural element to his work that I truly admire. David Jimenez: I simply adore David’s classic sensibility and attention to detail. His designs are elegant, tailored, and timeless. His Kansas City home was one of the first homes that I truly fell in love with when I first started blogging. It is done in a formal, elegant style, but maintains a relaxed and inviting quality. He has always been so gracious and kind to me and that gentlemanly demeanor is reflected in the classic spaces he creates. Steven Gambrel: Some of my favorite country houses are designed by Gambrel. He has designed some of the most amazing coastal-inspired houses in recent memory. Despite the fact that a home may be designated as a country home or beach home, he brings an urbane sophistication to each project. Unafraid to use bold colors, Gambrel often opts for beautiful blue hues reminiscent of the sea. Blue isn’t typically my favorite color, but he has made me a believer! This consummate designer is a trained architect and also designs furniture. Let’s hear it for the boys! Yesterday’s group was a cross-section of several aesthetics, while the designers in today’s post share a tailored, classic aesthetic infused with a knack for color. Of today’s group of designers, who would you choose to design your own home? Whose aesthetic is closest to your own style? HA!! I just posted my top four fave designers! Great minds must thing alike.. You chose a few that I left off my short list.. Good choices! These guys all rank in my top 20 as well. Gambrel and Jimenez in particular can do no wrong in my book. oooh i can't wait to go through all their portfolios... what a great idea for a post! Great post idea Paloma - I shall come back and read closer and catch up on the previous. I like your list - wow - but was less familiar with a couple, so thanks for the hot tips! Love these designers as well. Jimenez and Gambrel hit it out of the park every time. I love these men, I could marry them all!!! All of them have such fearless style and taste and they are amazing! Gorgeous rooms! I think it mau be hard to choose between them all. Love that O'Brien room with the black walls, I LOVE that black walls are a trend right now! David is so amazing!! Jaithan and I we very lucky to have dinner with him when we were in Kansas City. He is a doll! Hope all is well! I love Thom Filicia. I recently got to meet him when he did a book signing at H.D. Buttercup in Los Angeles. You can check out a pic of us here. Beautiful interior design. I like'em all! Very stylish!